1. 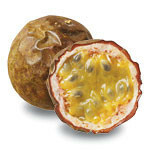 Place the Passion Fruit Concentrate, vinegar, sugar, and garlic in a saucepan and bring it to a boil. Boil for 5 minutes, until sauce reduces and thickens. 2. Remove from heat and season with salt to taste. Store sauce in refrigerator for 1 to 2 weeks.